I’ll refer to coal-produced electricity as my example here, since it’s the most commonly used. Imagine a large vat (aka a boiler) and near the top there are numerous pipes running through it filled with water. As coal is fed into the boiler and burned, it heats the water flowing through the pipes, converting it to a dry, hot steam. The steam from the pipes is under high pressure (like a whistling tea kettle), and when transported into an attached generator, it has a collective force strong enough to spin a large turbine. (Are you still with me? Don’t worry, it will all come together soon!) The turbine is very similar to a windmill that is turned by the wind (yet another form of energy), except in this case, the “wind” is steam. As the turbine spins, it rotates a series of magnets inside coils of copper wire within a generator. This rotating process moves electrons, and the magnetic field established between the coil and the magnets creates an electrical current — also known as electricity. It’s a bit like creating static electricity by rubbing your wool socks on fluffy carpet — allowing you to shock an unsuspecting victim — except on a mass scale. Think of the socks as the coiled wire and the carpet as the magnets. Pretty simple, right? Now that we’ve established how electricity is generated, we’ll explain how it arrives at your light switch. Once created, electricity is transported from the generator to a substation at the plant. The purpose of the stop at the substation is to convert the electricity’s voltage up to extremely high levels for long-distance transport on the transmission grid. This “step up” is done via a transformer. 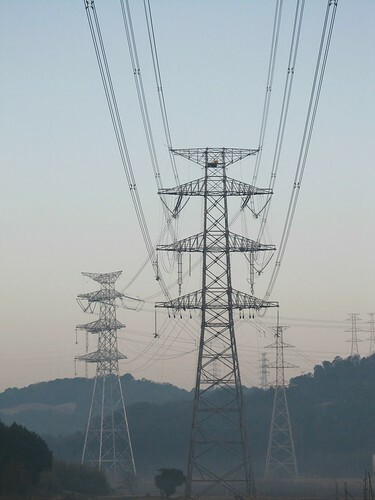 The electricity then travels across the country through “high-tension” power lines on extremely tall transmission towers, like the image to the right. As it nears populated areas, the electricity then passes through more substations where its voltage is stepped down, again by transformers; this process enables it to be delivered to you at a voltage level that your home’s electrical system can reasonably handle. The electricity is sent into your home over several wires. These wires run through to the electric meter, which measures how much electricity you use. This info is then captured by your utility company when they come to read your meter, or the info is sent directly to the utility if the home has a smart meter installed. Where does one end and the other begin? Who’s on first? Part of understanding how electricity works is knowing what players are involved in getting it to you. There are two primary components to note: supply and delivery. You’ll see these indicated on your electricity bill. The term “supply” is associated with the actual electricity being provided to your home or business. The company who supplies electricity has purchased a specified amount on the wholesale market, and is then reselling it to you, the consumer. A utility company such as ComEd may also provide supply services, though in a deregulated market, you have the option to select another company to supply your electricity. The supplier is essentially the company that has “ownership” of the electricity. Suppliers must submit to an extensive certification and vetting process in order to become suppliers. Supply also comprises transmission, which involves carrying electricity across the country to your utility, where the electricity is delivered locally. Delivery literally refers to the means by which your electricity is being physically transported to your home or business — through power lines, transformers, substations, and other electrical infrastructure. The entity responsible for this delivery is referred to as a utility company. ComEd and Ameren are both utility companies, for example. In some cases, a utility company may also own power plants supplying electricity, or they may just tap into the existing power grid to deliver electricity to your home or business. With regard to electricity, deregulation evolved as a way to bring transparency to the industry, and allow for increased competition among suppliers *ideally* for the purpose of reducing electric rates for residents and business owners. Previously, utility companies had a monopoly in the industry by both supplying and delivering the electricity (and in some cases, generating it as well), so the government eventually stepped in to ultimately respond to unhappy customers who felt they were being held hostage by the utility companies’ inflated rates. In a deregulated market, the utility company separates the supply and distribution services they offer, so they can compete with other suppliers while still maintaining responsibility for the delivery (distribution) of electricity to your home or business. Regardless of who supplies the electricity, the utility is still responsible for maintaining the wires, poles, and meters, along with restoring service should a power outage occur. Interestingly, despite being deregulated in terms of supply, utility companies continue to be regulated (by public utility commissions in each state) in how they set rates for transmission and distribution service, reliability and safety standards, and ensuring that all customers are provided with consistent service related to the delivery of electricity to your home or business (no matter your supplier). The beauty of this system is that it allows you to research different rates, find the best plan for your situation, and switch to another supplier without experiencing a disruption in your electric service. This is because your utility company will still be delivering the electricity even if you choose another supplier. Makes a lot of sense, doesn’t it? Now that you understand the dynamics of the electricity industry, you can make a switch without any reservations, knowing that your service won’t be affected and the switch can be made quickly and easily. Before you know it, you’ll be saving a bundle. So, don’t wait another minute, because if you have not yet switched from your default utility, you are most definitely paying more than you should be for electricity. Plain and simple. And yes, we know it sounds too good to be true, but this is indeed one of those rare instances in which competition DOES actually work (imagine that!) and savings can be achieved by simply opening your mind to trying something new. Over 260,000 households in Illinois have already made the switch — you can easily become one of them. Want to speak to a real living, breathing person? Call (847) 868-0247 — we’re always here to help!